WHEELER ARMY AIRFIELD, Hawaii - "A series of very difficult decisions . . . that would save the lives of a family of six, and one family pet." These are the words used by Hawaii Governor David Ige just prior to presenting Staff Sergeant Gregory A.Y. 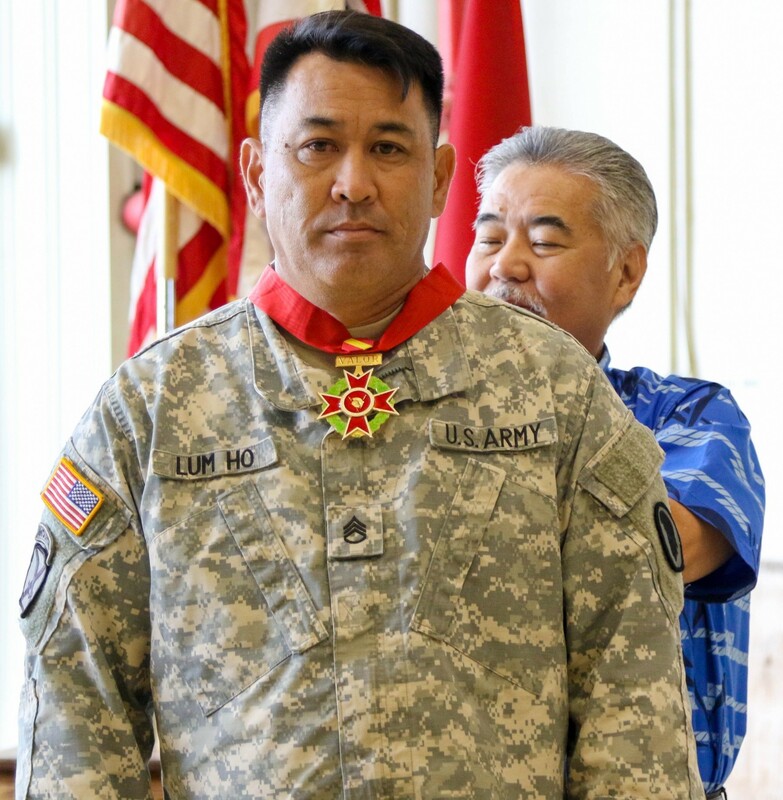 Lum Ho, Bravo Company, 777th Aviation Support Battalion, with the State Medal of Valor during a ceremony held at Wheeler Army Airfield, Hawaii on February 9. The Medal of Valor is awarded by the Governor to individuals who distinguish themselves through a performance of an uncommon act of personal heroism involving the voluntary risk of his/her own life. 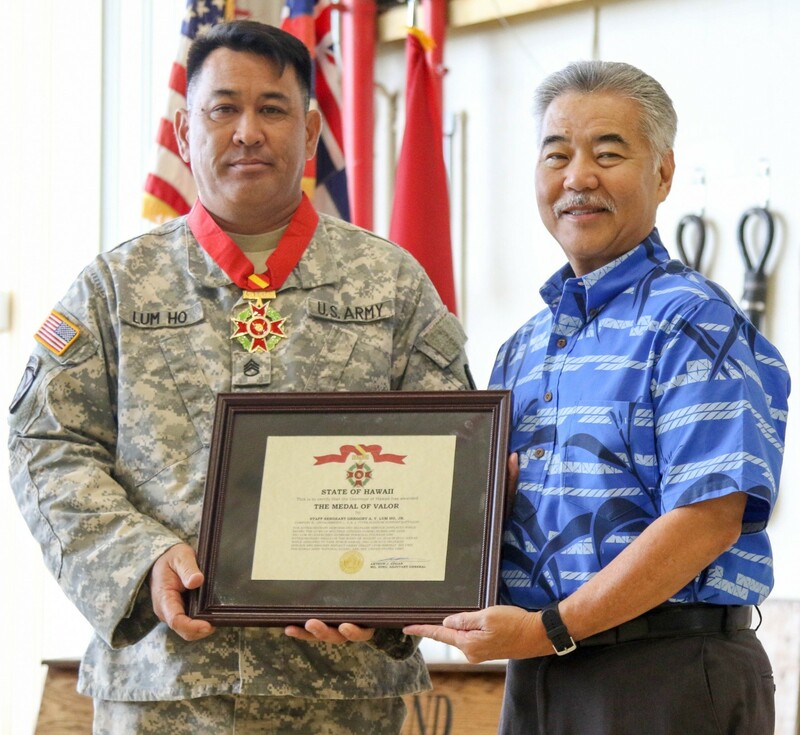 Governor Ige presented this medal to Lum Ho in recognition of his life-saving actions while serving as part of the Hawaii National Guard's emergency response to Hurricane Lane. On August 23, 2018, Lum Ho was assigned to the Lava Support Mission as a member of Task Force Hawaii, which was established in response to the Kilauea volcano eruption on the island of Hawaii. However, with Hurricane Lane closing in, Task Force Hawaii's mission quickly changed from lava support to hurricane support. That evening Lum Ho, along with Pvt. Justin Dejesus was assigned as a roving security patrol, but when Task Force Hawaii received a request for assistance from the Hawaii County Fire Department, Lum Ho was redirected to assist. "The hip-high water, the pouring rain, the rushed element of time, the number of first responders, your own security team, your own family, all were taken into consideration when you decided to use your Humvee to ferry the firefighters across swiftly moving water," the governor said, highlighting the weight of the decisions made by Lum Ho. "You displayed self-sacrifice and indisputably contributed to the alleviation of public tragedy." 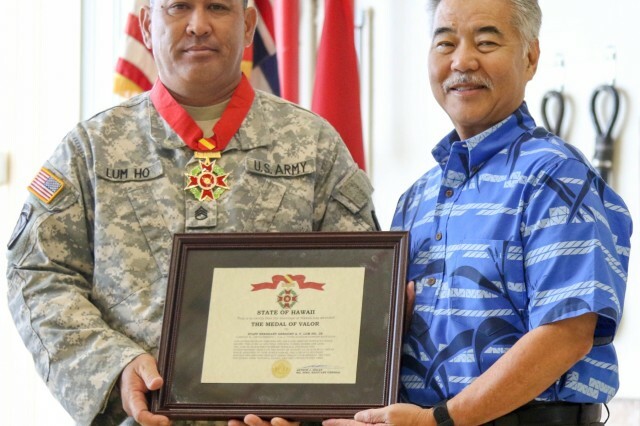 Finally, before presenting the Medal of Valor to Lum Ho, Governor Ige concluded, "You epitomize the Citizen-Soldier and are a shining example of what Valor is." "I think the leadership training we get in the National Guard prepares us for the situation where we need to make on the spot decisions," Lum Ho said. More importantly, he attributes the successful rescue to those by his side that night and the other members of Task Force Hawaii. Ultimately, Staff Sgt. 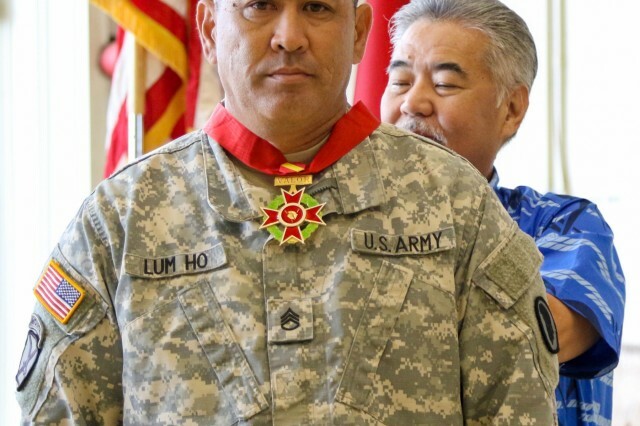 Lum Ho graciously accepted the Medal of Valor but was sure to emphasize that he was doing so on behalf of the Soldiers and Airmen of Task Force Hawaii, as well as his comrades in Bravo Company.